If you’re looking for coach hire in Portsmouth, or are heading to the south coast from somewhere else, then why not let National Coach Hire organise your trip? We are experts in travel around southern England, and can source the best coach hire quotes in and around the Portsmouth area. 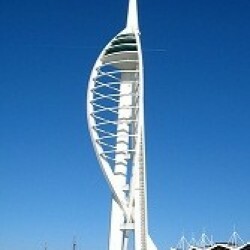 Portsmouth contains a similar mix of exciting nightlife and music, as well as historic attractions. From an eclectic selection of bars and clubs to the hugely impressive modern Spinnaker Tower at 170m high, to the Blue Reef Aquarium on the waterfront, the modern regeneration is changing the face of Portsmouth. Equally, the historic attractions keep visitors coming back every year. From the explosive Museum of Naval Firepower to HMS Victory, (Nelson’s flagship at the 1805 Battle of Trafalgar) to HMS Warrior and of course the famous Mary Rose, there is something for everyone, particularly those interested in Britain’s wartime history. From the Mary Rose museum, to the D-Day Museum, to the cobbled streets of the Point, the centre of Old Portsmouth, to Portsmouth’s historic dockyard with its fascinating collection of ships and museums, there are a number of attractions to keep visitors busy. 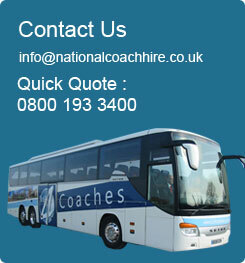 With so many attractions along the south coast, coach hire is the best way to get around. Whether you are coming to see the attractions or to support one of the rival football teams, (Portsmouth and Portsmouth enjoy a fierce rivalry) or whether you wish to use one of these cities as a base to explore elsewhere, National Coach Hire can help organize your trip. From the stunning Southsea Castle to a trip to the Isle of Wight; from the beautiful Cathedral cities of Winchester and Chichester to the 375 square kilometers of unenclosed heath and woodland that make up the majestic New Forest, and all over the region some of England’s finest countryside, coach hire really is the best way to experience Portsmouth, Portsmouth and the South Coast of England.